Offering baby changing facilities in your business is something that all companies should consider. Parents and carers will list such facilities as one of the top things they need when visiting a business but merely having them isn’t enough – they also need to be regularly maintained to ensure clean and safe spaces. TWC Group offers full baby changing facilities services ranging from providing the equipment required for the space to helping maintain it once it is set up. 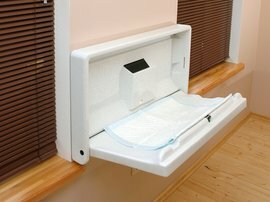 We have both vertically and horizontally mounted baby changing stations that are safe and hygienic, meaning they are easy to keep clean and can benefit from regular intensive cleaning. Everyday maintenance is something that can be handled by the in-house cleaning team or can be handled as part of our service. We can arrange cleaning visits on a schedule that suits your needs. If you have a high use business such as a café or shop, you may need weekly checks. On the other hand, if your facilities are used only occasionally, then less frequent visits will be the best solution. This is just one aspect of the comprehensive washroom service that we offer. We are based in North East England and can also offer services to Lincolnshire and Yorkshire areas. We can fully personalise the needs of your business into a service that is cost effective and high quality. This might include anything from nappy bag bin services to providing air fresheners and odour control. Our aim is to help your business create a clean and safe environment for all. Your local baby changing facilities provider. We provide our full range of baby changing facilities across the whole of North Yorkshire, East Yorkshire, West Yorkshire and South Yorkshire, operating out of our locally based depots situated in Hull and Thirsk. Our baby changing facilities in North Lincolnshire include our full offering and covers locations such as Scunthorpe, Grimsby, Brigg, Barton-upon-Humber and all the surrounding towns and villages across the Humber region. The baby changing facilities detailed are available to customers located in the North East region, including cities such as Middlesbrough, Durham, Sunderland, Newcastle, Gateshead and all of the nearby towns and villages.